NOTE: The original size of the text accompanying these strips is very small. For ease of reading larger text has been keyed in below each strip. A great ocean liner was nearing France. Aboard her was Tarzan of the Apes, returning home to his African jungle. Thinking, rather sorrowfully, over the past few weeks, he wondered if he had acted wisely. For he had renounced his birthright and the woman he loved. To a man to whom he owed nothing. Tarzan's thoughts drifted from the past to the future. He tried to look forward with pleasurable sensations to the scenes of his birth and boyhood. But who now would there be to welcome him in the fierce, cruel jungle where he had spent 20 of his 22 years. Only Tantor, the elephant, could he call friend. The others would hunt him or flee from him, as had been their way in the past. Not even the apes of his own tribe would extend the hand of fellowship. Civilization had become distasteful to him. He longed for the old jungle life. Yet he looked with little relish upon the future he had mapped out for himself. 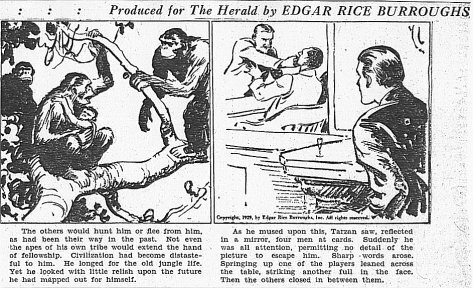 As he mused upon this, Tarzan saw, reflected in a mirror, four men at cards. Suddenly he was all attention, permitting no detail of the picture to escape him. Sharp words arose. Springing up one of the players leaned across the table, striking another full in the face. Then the others closed in between them. 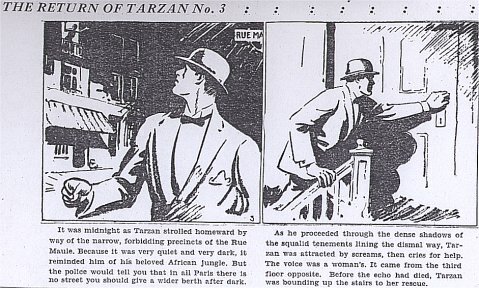 As the card-sharp tried to sneak away, he saw the exit barred by Tarzan's tall figure. Struggling and striking without effect, the fellow found himself in the ape-man's grasp. It was Nikola Rokoff's first experience with the muscles that had brought their savage owner victorious through encounters with Numa, the lion, and Terkoz, the great bull-ape. 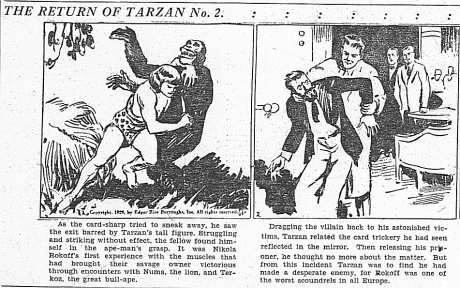 Dragging the villain back to his astonished victims, Tarzan related the card trickery he had seen reflected in the mirror. Then releasing his prisoner, he thought no more about the matter. But from this incident Tarzan was to find he had made a desperate enemy, for Rokoff was one of the worst scoundrels in all Europe. Next day the liner docked. 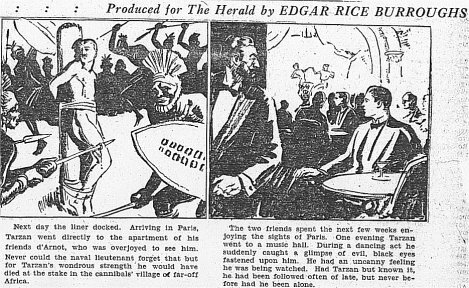 Arriving in Paris, Tarzan went directly to the apartment of his friend d'Arnot, who was overjoyed to see him. 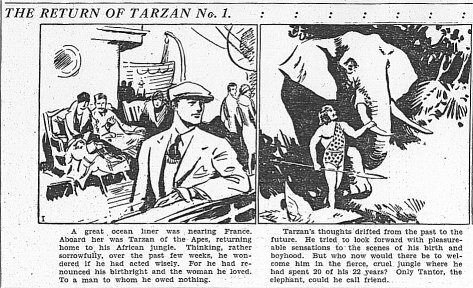 Never could the naval lieutenant forget that but for Tarzan's wondrous strength he would have died at the stake in the cannibals' village of far-off Africa. The two friends spent the next few weeks enjoying the sights of Paris. One evening Tarzan went to a music hall. During a dancing act he suddenly caught a glimpse of evil, black eyes fastened upon him. He had an uncanny feeling he was being watched. Had Tarzan but known it, he had been followed often of late, but never before had he been alone. It was midnight as Tarzan strolled homeward by way of the narrow, forbidding precincts of the Rue Maule. Because it was very quiet and very dar, it reminded him of his beloved African jungle. But the police would tell you that in all Paris there is no street you should give a wider berth after dark. As he proceeded through the dense shadows of the squalid tenements lining the dismal way, Tarzan was attracted by screams, then cries for help. The voice was a woman's. It came from the third floor opposite. 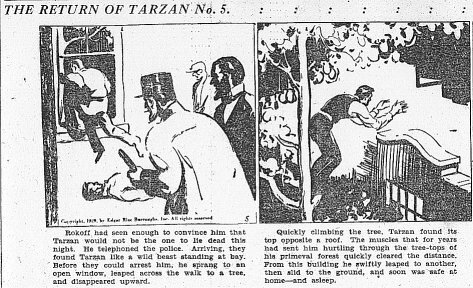 Before the echo had died, Tarzan was bounding up the stairs to her rescue. Behind a door Tarzan heard again the same appeal that had lured him from the street. Another instant found him in the center of a dimly lighted room. A dirty oil lamp cast its dull rays over a dozen repulsive figures. All but one were men, the other, a woman, crouched against a wall. "Help, monsieur," she cried in a low voice to Tarzan. "they are killing me." He saw the crafty, evil faces of habitual criminals and beheld with amazement two other things. One was a man sneaking stealthily form the room. It was Rokoff, his sworn enemy. The other thing was of more immediate interest. Tarzan turned just in time to see a burly brute of a man poised with upraised club. The others, drawing evil knives, now rushed upon him. But the brain, agility, and muscles that had coped with the mighty strength of apes and lions was not to be so easily subdued as these Apaches of Paris believed. 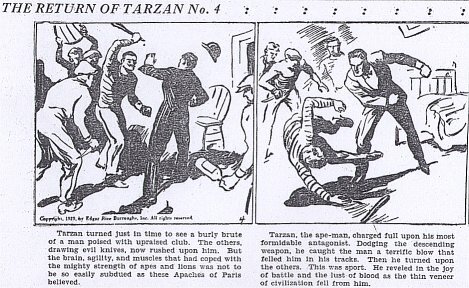 Tarzan, the ape-man, charged full upon his most formidable antagonist. Dodging the descending weapon, he caught the man a terrific blow that felled him in his tracks. Then he turned upon the others. This was sport. He reveled in the joy of battle and the lust of blood as the thin veneer of civilization fell from him. His strong white teeth found the throat of one assailant. He fought as he had learned to fight the great bull apes of the tribe of Kerchak. Panther-like, he leaped about the room. Bones broke in his iron grasp. Shrieks came from the bleeding Apaches. 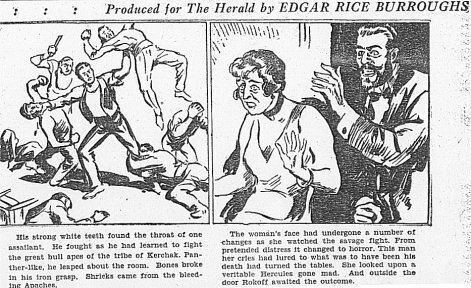 The woman's face had undergone a number of changes as she watched the savage fight. From pretended distress it changed to horror. This man her cries had lured to what was to have been his death had turned the tables. She looked upon a veritable Hercules gone mad. And outside the door Rokoff awaited the outcome. Rokoff had seen enough to convince him that Tarzan would not be the one to lie dead this night. He telephoned the police. Arriving they found Tarzan like a wild beast standing at bay. 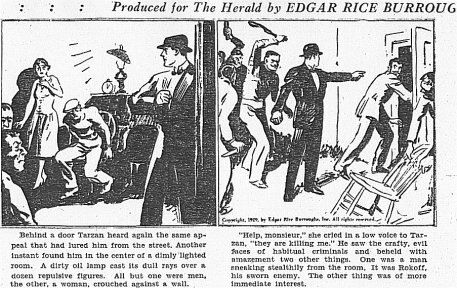 Before they could arrest him, he sprang to an open window, leaped across the walk to a tree, and disappeared upward. Quickly climbing the tree, Tarzan found its top opposite a roof. The muscles that for years had sent him hurtling through the tree-tops of his primeval forest quickly cleared the distance. From this building he swiftly leaped to another, then slid to the ground, and soon was safe at home -- and asleep. Lieutenant d'Arnot had succeeded in obtaining for Tarzan a commission in the diplomatic service. It required great physical courage and was a secret mission. Tarzan was overjoyed, for it promised adventure. And so it came that he bade his friend and Paris adieu and crossed to northern Africa. A certain officer had stolen information of great value, which his government suspected a rival power desired. A noted Parisienne, in a jealous mood, had caused suspicion to rest upon him. 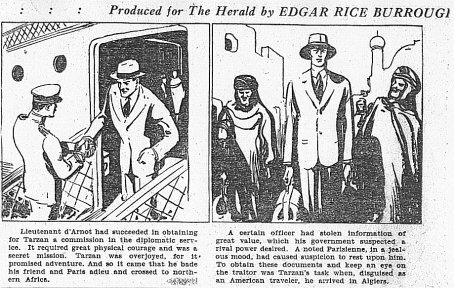 To obtain these documents and keep an eye on the traitor was Tarzan's task when, disguised as an American traveler, he arrived in Algiers. 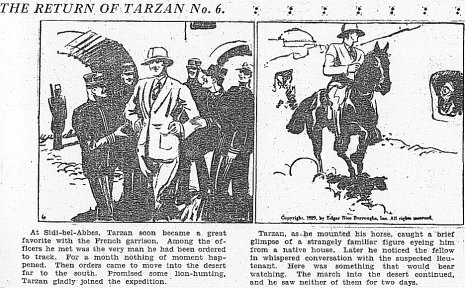 At Sidi-bel-Abbes, Tarzan soon became a great favorite with the French garrison. Among the officers he met was the very man he had been ordered to track. For a month nothing of moment happened. Then orders came to move into the desert far to the south. Promised some lion-hunting, Tarzan gladly joined the expedition. Tarzan, as he mounted his horse, caught a brief glimpse of a strangely familiar figure eyeing him from a native house. Later he noticed the fellow in whispered conversation with the suspected lieutenant. Here was something that would bear watching. The march into the desert continued, and he saw neither of them for two days. Market day at Sidi Aissa brought camel caravans in from the desert. Fascinated at these new sights Tarzan lingered a day's march behind the soldiers. Before leaving the bazaars he hired a youthful Arab as interpreter and servant. 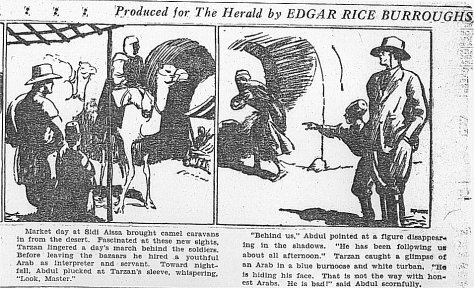 Toward nightfall, Abdul plucked at Tarzan's sleeve, whispering, "Look, Master." "Behind us," Abdul pointed at a figure disappearing in the shadows. "He has been following us about all afternoon." Tarzan caught a glimpse of an Arab in a blue burnoose and white turban. "He is hiding his face. That is not the way with honest Arabs. He is bad!" said Abdul scornfully.